Crewest Gallery News: Marka27: Double Toy Release This Weekend! Marka27: Double Toy Release This Weekend! Our boy Marka27 is killing it with these Minigod colorways! This Dia de Los Muertos edition is sick with it! As if that wasn't enough, he's bringing the Killa Instinct with the glow in the dark effects! DOUBLE TOY RELEASE WITH "FREE GIVE AWAYS"!! 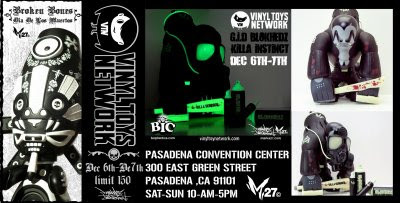 @ VINYL TOY NETWORK! Second from Marka27 Produced by BIC PLASTICS is the new "BLOKHEDZ"
Davis the creators of BLOKHEDZ.